- Opposition team pass the ball from side to side, Target team are the defending team and shadow forcing the ball inside. Only 1 yellow player is allowed passed the half line. 2. 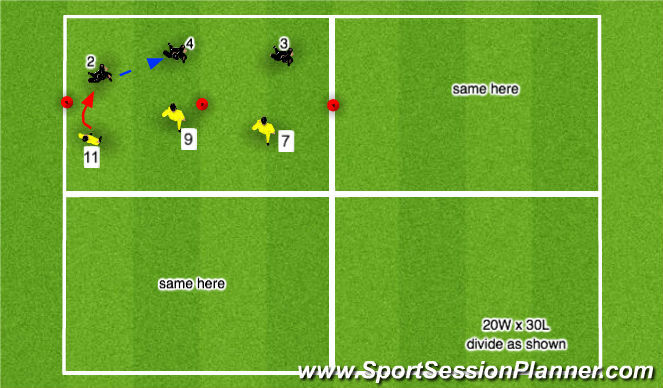 Yellow player can steal the ball and transition it to the end line upon winning. - The Yellow team will try to regain the ball back in the attacking half right immediately after they lose possession. 3. 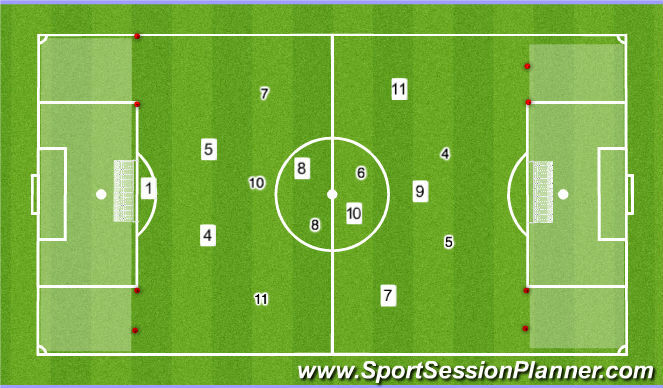 Communication - What does the Covering player(s) TELL the pressuring/delaying defender? - Opposition team (Black): #2, #3, #4, #6, #8. - Both teams play to score in their opponent's goals. - A goal scored after recovering the goal in the attacking half is worth 50 points. All other goals are 1 point. - The game is to 150 points. 2. How to establish a line of confrontation. - Opposition team (Black) formation: 1-2-3-2 (#1, #4, #4, #6, #7, #8, #10, #11). - Play a regulation game with all FIFA Laws.